Jul 1, 2018 – WATKINS GLEN, N.Y. Both Acura Team Penske and Meyer Shank Racing continued their runs of 2018 IMSA WeatherTech SportsCar Championship podium finishes today at Watkins Glen International Raceway, as well as claiming both Prototype and GTD victories in the North American Endurance Championship “series-within-a-series” at the Sahlen’s Six Hours of the Glen. Despite extremely high trackside temperatures throughout the six-hour endurance contest, Juan Pablo Montoya and Dane Cameron combined to finish third overall and in the Prototype class; while Katherine Legge and Alvaro Parente reunited to finish second in GTD, moving Legge to within a single point of the GTD Drivers’ Championship lead. Acura Team Penske’s Cameron claimed the lead on the opening lap in his #6 ARX-05, with Ricky Taylor slotting his #7 Acura into third, as both successfully avoided an opening-lap, multi-car crash. After opening-hour battles with the prototypes from JDC-Miller Motorsports and United Autosports, the Acura Team Penske pair established themselves at the front of the field. As the contest reached the two-hour mark, the starting drivers handed over to co-drivers Helio Castroneves, taking the lead in the #7 Acura, and Montoya, now second in the #6 ARX-05. Just 30 minutes later, Castroneves was forced to make an unscheduled pit stop due to an apparent transmission issue, losing several laps while repairs were completed. Castroneves and Taylor would persevere to finish 12th. Montoya and Cameron remained at or near the front through the remainder of the contest, gathering maximum manufacturer NAEC points at the three-hour mark. Losing the lead briefly to Wayne Taylor Racing after the final round of pit stops, Montoya made a move to the front on a late-race restart with just 36 minutes remaining. But as Montoya passed Jordan Taylor in the WTR prototype, Stephen Simpson made it three-wide to gain the lead, and the victory. Meanwhile, a brief hesitation from the #6 Acura – due to low fuel – slowed Montoya in the run from the final turn to the checkers, and resulted in a third-place finish. Still, a third consecutive podium finish for Cameron and Montoya – following a second-place finish at Mid-Ohio and third in Detroit – moves the pair unofficially into a tie for third in the Drivers’ Championship after six of 10 rounds. Acura is second in both the overall (by nine points) and NAEC (by just two points) Manufacturers’ Championships. In GTD, Meyer Shank Racing’s Lawson Aschenbach and Alvaro Parente both successfully avoided the opening-lap contact, with Aschenbach taking the #93 NSX GT3 to second in the opening hour, with Parente holding down fifth in GTD in the #86. At the two-hour mark, Acura led both overall and in GTD, with Aschenbach’s co-driver, Justin Marks, at the front. But just 30 minutes later, a prototype cut across the nose of the #93 Acura, sending it to the pits and eventually out of the race with suspension damage. Meanwhile Katherine Legge, taking over from Parente in the #86, moved to the front of the GTD field following an outside pass in the famed Watkins Glen “esses”. Legge and Parente would remain in the thick of an exciting, multi-car battle for GTD honors for the rest of the day. 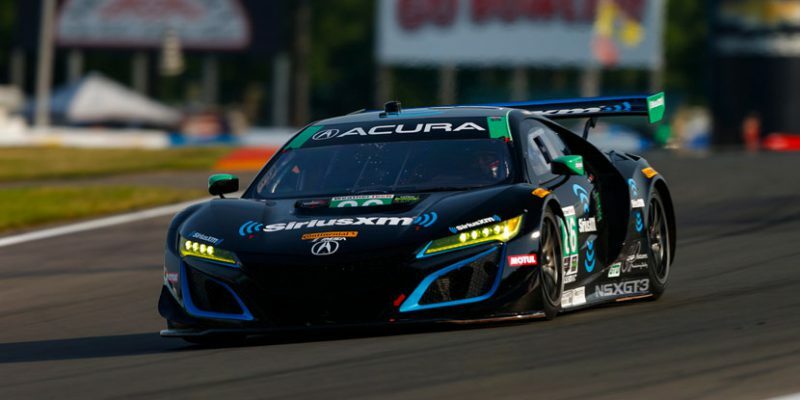 After a hard-fought six hours of racing, the pair finished second – the fourth podium finish [including a win in Detroit] in five races for the #86 Acura, while gathering the largest number of NAEC points at the three and six-hour marks. As a result, unofficial totals have Legge just a single point out of the GTD Drivers’ Championship lead, with Acura seven points behind Lamborghini in the Manufacturers’ Championship. Legge and Parente also are second in the NAEC drivers’ points chase, just two points out of first; while Acura is a single point behind Mercedes-Benz in the NAEC manufacturers’ battle. The Sahlen’s Six Hours of the Glen also saw the return of Acura NSX GT3s fielded by C.J. Wilson Racing and the Honda associate-operated Honda of America Racing Team. The CJR duo of Marc Miller and Till Bechtolsheimer had a drama-free run and demonstrated improving pace to finish 11th in the 18-car GTD field. An impressive run from starting driver Tom Dyer saw the HART Acura run as high as ninth before retiring from the race after 76 laps. After consecutive podiums for Acura at Mid-Ohio, Detroit and Watkins Glen, the WeatherTech SportsCar Championship now moves to another classic road course. Canadian Tire Motorsports Park, located outside of Toronto, will be the site of the July 8 Mobil 1 Sportscar Grand Prix. Video recaps from this weekend’s Acura racing activities at Watkins Glen will be posted on the “Honda Racing/HPD” YouTube channel. Produced by the Carolinas Production Group, the video packages can be found in the 2018 HPD Trackside Video Playlist at: https://www.youtube.com/HondaRacingHPDTV.